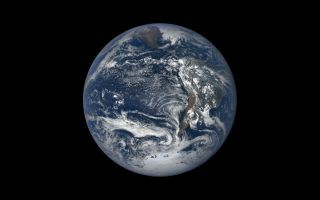 NASA's DSCOVR satellite took this photo of Earth on Dec. 20, 2018, one day before the solstice. The December solstice arrived today (Dec. 21), marking the start of winter in the Northern Hemisphere and the first day of summer for the Southern Hemisphere. It's also the shortest day of the year for those in the Northern Hemisphere, where the sun will now begin to shine a little bit longer by the day. Meanwhile, those in the Southern Hemisphere are experiencing the longest day of the year. DSCOVR, which launched in 2015, monitors Earth's climate and space weather from the L1 Lagrange point, where it takes a new photo every 2 hours. You can keep up with the latest images from DSCOVR's Earth Polychromatic Imaging Camera (EPIC) at epic.gsfc.nasa.gov.